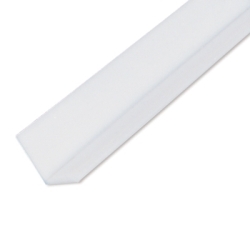 1/2" Thick x 3-1/2" L x 3-1/2" W UHMW PE L-Angle | U.S. Plastic Corp. This Ultra High Molecular Weight (UHMW) Polyethylene shape has exceptionally high abrasion and impact resistance properties. It will outwear all other materials, including metals, nylons, urethanes, and fluoroplastics. In corrosion resistance, it has the same qualities of other polyethylenes. The working temp range is from -60°F to 180°F. Because it resists wear, friction and corrosion, it cuts maintenance costs, energy consumption, and extends equipment life. Its properties include: low coefficient of friction, self-lubrication, non-adherent surface, FDA and USDA concurrence for contact with foods, drugs, etc. Sold in 10' sections only. Advise if we can cut in half to ship UPS.